Eagle Bank 2013 Annual Report: There when it counts. When a small business needs help most, health a community bank has the most to offer – enabling fellow entrepreneurs to survive and thrive. 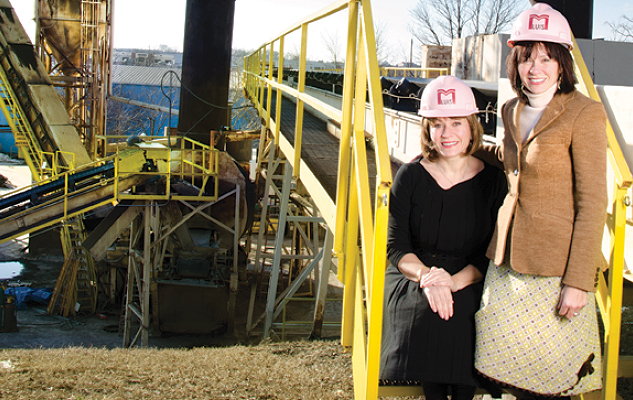 Cidalia Luis-Akbar and Natalia Luis had guided M. Luis Construction through the recession. But then the sisters’ troubles began. The Maryland-based road construction company their parents started in 1985 had achieved great success. Looking to build on that success, in late 2010 the sisters invested millions in an asphalt manufacturing plant in Rockville, MD. In February 2011, a fire destroyed the company’s central operations hub, a loss worth several million dollars. Then the rains came. Over several months, record-setting rainfall throughout the region washed out construction schedules, greatly reducing M. Luis Construction’s revenues. As a result, the company’s relationship with a national bank ended—the bank that had been M. Luis’s lender of choice for over twenty-five years. That’s when we learned about the sisters’ predicament from a mutual friend. (At EagleBank, we’re all about relationships.) As entrepreneurs ourselves, we understand that all small-business owners face challenges. From time to time, unforeseen events will demand unconventional thinking and unusual flexibility. That’s par for the course. We also understand that, for small-business owners, timely access to money is what keeps the lights on. We met with the Luis sisters and recognized them as fellow entrepreneurs—passionate, capable, energetic people running a successful family business. People who had just hit a rough spot and needed a hand. So we were happy to do for M. Luis Construction what its national bank wouldn’t: We provided an $8.6 million line of credit that enabled the firm not only to keep going, but to continue growing. Others took notice. Last fall, President Obama invited the Luis sisters to the White House for an event celebrating the contributions small businesses make to the economy by creating jobs, improving infrastructure, and strengthening communities. The following month, the President visited M. Luis Construction’s Rockville facilities for another day of celebrating small-business success. Stories like that of the Luis sisters and M. Luis Construction are ones we never tire of hearing—or being a part of. Because we believe in the power and passion of entrepreneurs, and the difference only a community bank like EagleBank can make in their success.